Woking Business Profiles: McLaren Group | Curchod & Co.
Woking is growing in popularity as a commercial office location. For emerging businesses looking for an affordable and flexible space to large global enterprises searching for a well-located head-quarters, Woking fits the bill. But this town is by no means a new kid on the block. Nearly 20 years ago, what is now the McLaren Technology Centre began construction at its site in Woking, Surrey. Since then, McLaren Group and the site itself have grown. Most recently, McLaren Group have agreed a 20-year lease for the 65,000 sq ft Victoria Gate building in central Woking, showing still further confidence in the town. We look at what makes this location such an effective, and enduring, location for enterprises. Work began on what was originally known as the Paragon Technology Centre in 1999. It was the largest privately funded construction project at that time and involved around 4,000 construction workers. Subsequent to the initial building, two further buildings were constructed on site with plans for a fourth approved in 2016. Before the construction of the Technology Centre and additional buildings, the group was located over 18 different sites. All this goes to demonstrate the confidence McLaren Group have in Woking as its Global HQ. The businesses within the group employ a huge swathe of the local population, and McLaren are a very influential business with a recognised worldwide brand. The original McLaren Technology Centre building was short-listed for the 2005 Stirling Prize. The collection of buildings on site are constructed with high specification at their core. This isn’t simply down to the technological requirements of the business, but is indicative of the value that the group places on staff conditions. The design of the building places a priority on natural light, which in turn increases the comfort and efficiency of employees at the Woking site. 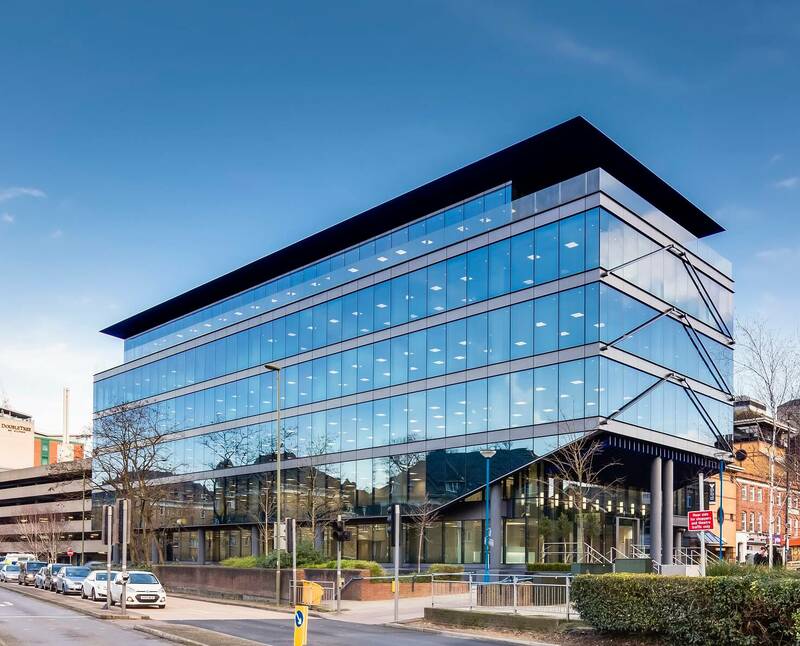 The importance of a high spec office space in attracting a good calibre of tenants is further displayed by McLaren Group’s lease of Victoria Gate in central Woking. The building has undergone a full refurbishment by Aviva Investors and is a great example of how innovative businesses prioritise superior office space. Their choice of building and location helps to attract the best engineers and designers to the company. The location of the McLaren Technology Centre is not simply down to finding a site with sufficient space. The group’s location in Woking offers easy access across the south of England from its proximity to the M25 and M3. Access into London is therefore also straightforward, benefiting both employees and visitors. Ever progressive, McLaren have now combined their rural location with office space right in the centre of Woking town at Victoria Gate, showing the benefits of both approaches to choosing location. Part of the reasoning behind the location of the McLaren Technology Centre in Woking is the natural environment of the site. The McLaren Group is open in its targets towards carbon neutrality, and in 2011 McLaren Racing was announced as the first ever carbon neutral team in Formula 1. As part of the HQ construction project, McLaren replaced unhealthy topsoil, planted 100,000 trees and shrubs, laid down footpaths and introduced public access. This commitment to local wildlife has been rewarded by the return to the area by kingfishers, waterfowl, dragonfly species and even a family of otters. The buildings which form the base at Woking’s McLaren Technology Centre were designed with technology in mind. As time has passed, updates to the building have been undertaken to ensure energy efficiency. The company’s efforts to update technology have led to the production of bespoke designs which are used for energy efficient outdoor lighting. This ongoing commitment to the health and maintenance of the building is a vote of confidence in both the town of Woking and the future of the industry. With a 20 year lease of central Woking’s Victoria Gate agreed and plans to build the Applied Technology Centre well underway, the organisation have underlined their commitment to the town of Woking long into the future. At Curchod & Co we expect to see many other corporate occupiers follow suit in moving into the town.